Use a standard 8-oz. measuring cup. Note: Individual dog's requirements may vary from this chart due to age, breed, environment and activity level. Adjust food as required to maintain optimal body condition and ask your veterinarian if you are unsure. 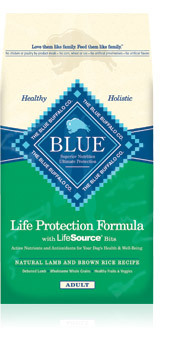 Keeping your dog healthy is now more important than ever. It's only natural for mature dogs to begin slowing down and to put on a few extra pounds. Older dogs are more susceptible to health issues associated with aging. 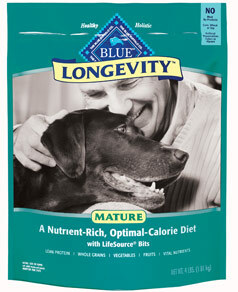 BLUE Longevity is the perfect food for your mature dog. 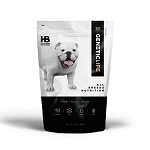 It's a delicious blend of nutrient-rich foods with low caloric density that will satisfy your dog's hunger, help prevent him from gaining extra, unhealthy weight and provide all of the nutrition he needs to enjoy life. 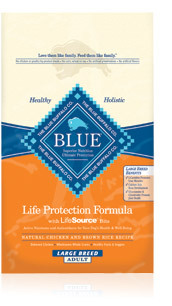 BLUE Longevity dog food is a delicious blend of lean protein, nutrient-rich vegetables, fruits and wholesome whole grains. Our animal nutritionists selected these ingredients because they contain a wide variety of anti-aging nutrients that are shown to support a dog's natural defenses against the cellular destruction associated with many age-related diseases.